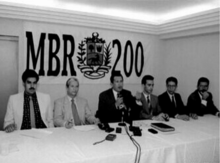 After defecting from Venezuela, former bodyguard for Chávez, Leamsy Salazar, stated that he died in December 2012, months before his date was officially announced.In July 2018, former Attorney General Luisa Ortega Díaz also said that Chávez had actually died in December 2012 and the announcement of his death was delayed for political reasons. In an interview cited by Venezuelan daily El Nacional, the former Chávez supporter said that the Venezuelan president died on 28 December, but his closest allies decided to delay the announcement and never submitted the death certificate to the Office of the Attorney General. The supposed delay in announcing Chávez's death raised concerns that laws signed in his name during that period were forged for political purposes. Order of José Marti Cuba 17 November 1999 Havana Cuban highest order of merit. First Class of the Order of the Islamic Republic of Iran Iran 29 July 2006 Tehran Highest national medal of Iran. Order of Augusto César Sandino Nicaragua 11 January 2007 Managua Highest honor of the Republic of Nicaragua. Order of the Republic of Serbia Serbia 6 March 2013 Belgrade Serbian highest order of merit. Awarded posthumously. ^ a b c "Estrategia de Cooperación de OPS/OMS con Venezuela 2006–2008" (PDF) (in Spanish). Pan American Health Organization. June 2006. pp. p. 54. Archived from the original (PDF) on 24 October 2006. Retrieved 31 December 2006. ^ a b Pretel, Enrique Andres (2 September 2010). 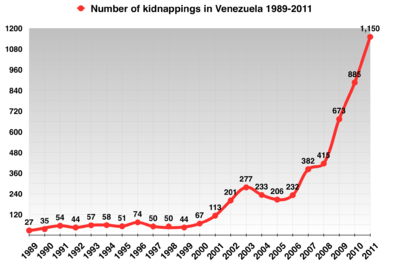 "Chavez defends his record on crime in Venezuela". Reuters. Archived from the original on 16 September 2010. Retrieved 10 September 2010. ^ a b "Chavez criticizes US take on crime in Venezuela". The Boston Globe. 27 March 2012. Archived from the original on 17 December 2013. Retrieved 16 May 2012. ^ a b c "Hugo Chavez admits to being Marxist, just like Christ | World | RIA Novosti". En.ria.ru. 16 January 2010. Retrieved 19 May 2014. ^ a b Valery, Yolanda (1 January 1970). "BBC Mundo – América Latina – El marxismo según Chávez". Bbc.co.uk. Retrieved 19 May 2014. ^ a b Campos, Zurimar. "Chávez afirma que es "marxista" pero reconoce que todavía no ha leído "El Capital" en". Noticias24.com. Retrieved 19 May 2014. ^ a b Vinogradoff, Ludmila (3 June 2010). "Chavez se declara marxista – Internacional_Iberoamerica – Internacional". ABC.es. Retrieved 19 May 2014. ^ a b c Jeff Colgan (31 January 2013). Petro-Aggression: When Oil Causes War. Cambridge University Press. p. 209. ISBN 978-1107029675. Retrieved 27 June 2016 – via Google Books. 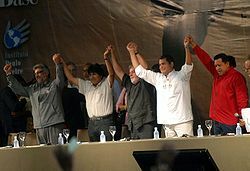 For Chávez the show accomplishes a number of political objectives. First, it sustains and builds popular support for his leadership. By spending hours each week in front of a camera Chávez reinforces the message that he is the leader of his political movement and the government of Venezuela, its living symbol. Second, the television show is oriented to, and popular among, the lower classes of Venezuela who have traditionally remained outside of the political process. ^ Kahn, Jeremy (3 February 2003). "Pumping Trouble: A strike in Venezuela has raised temperatures in Caracas and oil prices around the world". CNN. Archived from the original on 22 April 2014. Retrieved 21 April 2014. ^ "Church warns Venezuela govt on constitution". France 24. Agence France-Presse. 7 January 2013. Archived from the original on 11 January 2013. Retrieved 8 January 2013. ^ a b c Lendman, Stephen. "Wall Street Journal Claims Chávez Oil Policy "Aims to Weaken US"". COA News. Archived from the original on 30 April 2009. ^ Rocco, Cotroneo (17 August 2007). "Chávez insists for socialism" (in Italian). Corriere della Sera.it. Retrieved 22 August 2011. ^ Keppel, Stephen (17 January 2014). 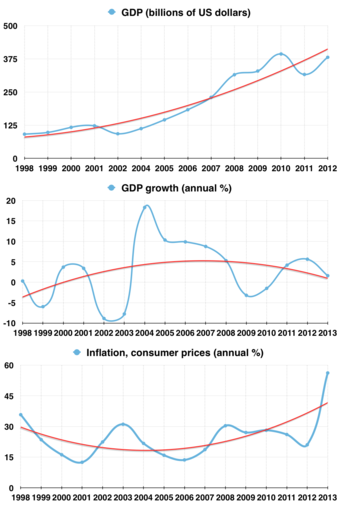 "5 Ways Hugo Chavez Has Destroyed the Venezuelan Economy". Fusion. Archived from the original on 19 September 2014. Retrieved 21 April 2014. ^ Bowman, Betsy; Stone, Bob (July – August 2006). "Venezuela's Cooperative Revolution". Dollars and Sense. 15 (266). ^ Goodman, Joshua (22 January 2014). 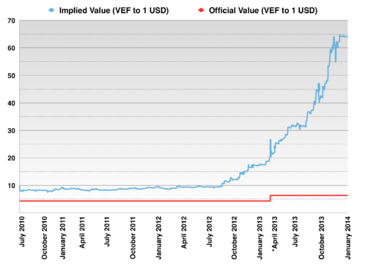 "Venezuela overhauls foreign exchange system". Bloomberg L.P. Archived from the original on 14 February 2014. Retrieved 26 January 2014. ^ a b c "Venezuela: Gravísima Crisis de Seguridad Pública by Lexys Rendon". ISSUU. Retrieved 18 October 2015. ^ a b "Según el Cicpc el 2011 cerró con 1.150 secuestros en todo el país – Sucesos". El Universal. Retrieved 18 October 2015. ^ Gallegos, Raul (10 January 2014). "Miss Venezuela's Murder Is the Price of Politics". Bloomberg L.P. Archived from the original on 27 January 2014. Retrieved 10 January 2014. ^ "United Nations Office on Drugs and Crime (UNODC) – Murder rates (most recent year) – spreadsheet". Archived from the original on 9 March 2013. Retrieved 8 March 2013. ^ "Violence in Venezuela". The Stream. Al Jazeera English. 6 August 2011. Archived from the original on 11 November 2013. Retrieved 14 April 2012. ^ "Venezuela's Collapse". Bloomberg. 14 May 2018. Retrieved 22 May 2018. ^ Crabtree, Steve; Naurath, Nicole. 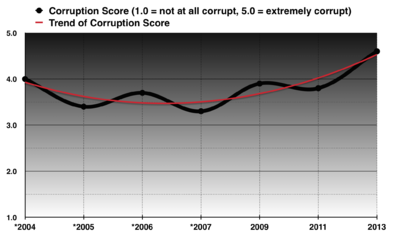 "Gallup Launches Worldwide Corruption Index". Gallup Poll News Service. Archived from the original on 24 November 2007. Retrieved 21 December 2006. ^ a b c "Venezuela: Protestors in civil disturbances". Amnesty International. Archived from the original on 22 March 2004. Retrieved 15 December 2014. ^ "Venezuelan government deliberately targeting opponents". Amnesty International. 1 April 2010. Archived from the original on 16 August 2013. Retrieved 27 February 2012. ^ "Hugo Chavez And Anti-Semitism". Forbes. 15 February 2009. Retrieved 19 May 2014. ^ a b "As it slides toward authoritarianism, Venezuela targets one of its last independent newspapers". The Washington Post. 5 July 2018. Retrieved 6 July 2018. ^ "Guyana to Try for Better Oil Rates Under Caracas Accord". 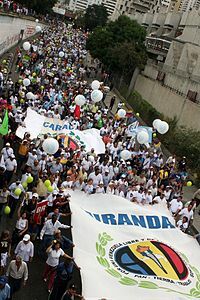 Guyana Diary (Monthly Newsletter of the Guyana Embassy, Caracas, Venezuela). February 2004. Archived from the original on 6 March 2005. Retrieved 14 June 2006. ^ "Venezuelan VP rules out declaring temporary absence of Chávez". Archived from the original on 14 May 2013. ^ Naranjo and Cawthorne, Mario and Andrew. "Venezuela's Chávez says "totally free" of cancer, again". Yahoo News. Archived from the original on 12 July 2012. Retrieved 9 July 2012. ^ "Venezuela's Chávez 'overcomes infection'". Aljazeera.com. Retrieved 2 February 2013. ^ Pike, John (26 January 2013). 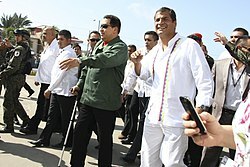 "Chávez Begins New Treatment Course – Vice President". Globalsecurity.org. Retrieved 2 February 2013. ^ a b "El jefe de Seguridad de Chávez declaró que el caudillo murió dos meses antes de la fecha oficial". Infobae. 29 January 2015. Retrieved 30 January 2015. ^ Web, El Nacional (12 July 2018). "Diosdado Cabello a Luisa Ortega Díaz: "vente que Chávez se murió"". 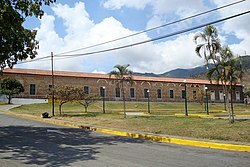 El Nacional (in Spanish). Retrieved 12 July 2018. 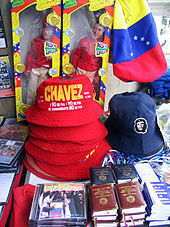 ^ "Highest Badge of Honor Granted to Chavez". Fars News Agency. 30 July 2006. Archived from the original on 3 January 2012. Retrieved 12 June 2013. ^ "Председник Николић постхумно одликовао Уга Чавеса, председника Венецуеле". Predsednik.rs. 6 March 2013. Archived from the original on 20 October 2013. Retrieved 7 March 2013. ^ "UNI otorgará "Honoris Causa" a Chávez" (in Spanish). El Nuevo Diario. 5 January 2007. Archived from the original on 22 October 2013. Retrieved 15 June 2013. López Maya, Margarita (2003). 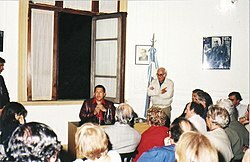 "Hugo Chávez Frías: His Movement and His Presidency". In Ellner, Steve; Hellinger, Daniel (eds.). Venezuelan Politics in the Chávez Era: Class, Polarization and Conflict. Boulder: Lynne Riener. pp. 73–92. ISBN 978-1-58826-297-4. Anderson, Jon Lee (28 January 2013). "Slumlord : what has Hugo Chávez wrought in Venezuela?". Letter from Caracas. The New Yorker. 88 (45): 40–51. Retrieved 8 April 2015. Shifter, Michael, M. (May – June 2006). "In Search of Hugo Chávez". Foreign Affairs. 85 (3): 45–59. doi:10.2307/20031966. JSTOR 20031966. "Controversial Venezuelan Leader Hugo Chavez's Death Teaches Vital Lesson About Cancer". Archived from the original on 27 March 2013.